Big Hat Tours - Hitler was an architect? False In Mein Kampf, Hitler claimed he was an architectural draftsman in Munich before WW I. In truth, there is no evidence ever held a job in his life at all. After his rejection from art school, Hitler took no steps to become a draftsman, took no training, and apparently never even applied for a position as a draftsman or architect. He was a high school dropout at age sixteen, and it is doubtful an architecture school would have admitted him even if he had applied. None of this, however, ever blunted his fascination with the field. As chancellor, he showed little interest in governing Germany. He spent much of his time at his mountain retreat, Berghof, envisioning the dreamed cities he would build in the east and watching British films. 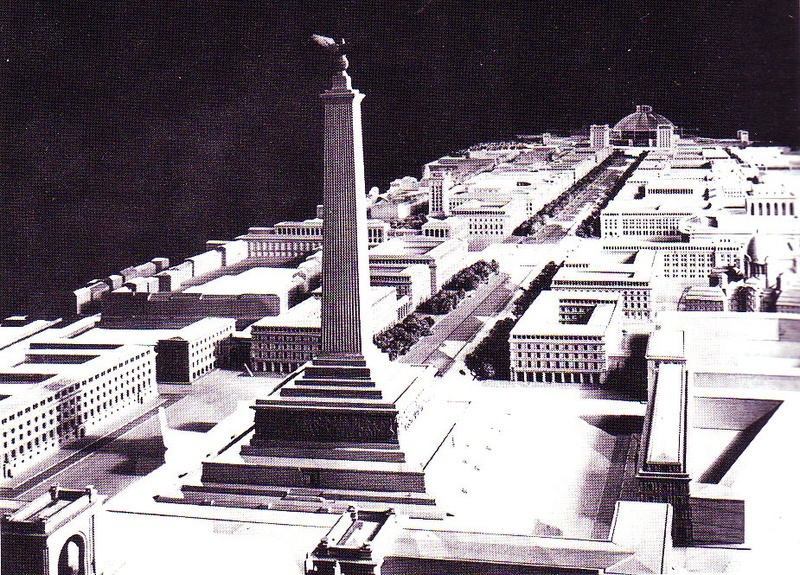 Munich's Paul Troost was Hitler's first guru in the field of architecture. 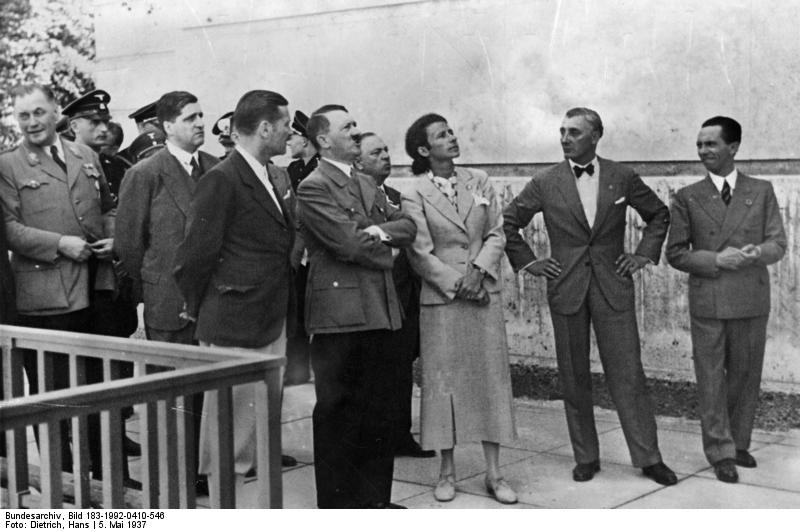 Troost was hired to remodel The Brown House, the Nazi party headquarters in Munich between 1930 and 1931. 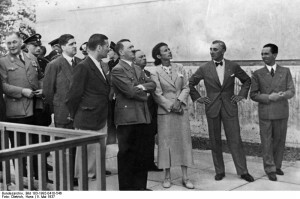 Troost's work held fascination for Hitler, who would visit the architect's studio whenever he could. Troost's most famous surviving work is the Nazi Palace of art, the Haus der Kunst (see above). It was erected at the entrance of the Englisher Garden. The Nazis put on a lavish opening for the art gallery, complete with parades and speeches. Joseph Goebbels, the Propaganda Minister, also put on a show of "degenerate art", which premiered at about the same time in a gallery at the nearby Hof Garden. While 420,000 people visited the Nazi art gallery, almost three and a half times as many (over 2 million people) attended the degenerate art show. Oddly, the Nazis then toured the degenerate show through ten cities in Germany. 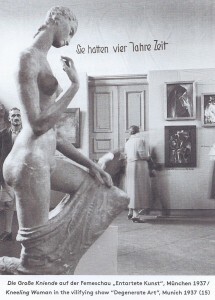 During the twelve years of National Socialism, hundreds of modern artists were persecuted, dismissed from teaching positions and forced to emigrate. Some committed suicide. 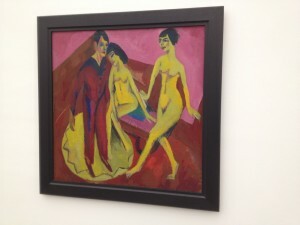 Works by Max Beckman, Ernst Ludwig Kichner, Marc Chagall, Henri Matisse and Vincent van Gogh were seized and either sold at auction in Switzerland or destroyed. 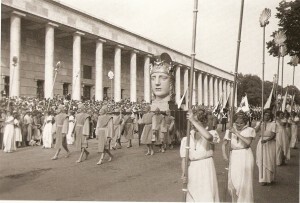 Footnote to History: At the dedication ceremony of the Haus Der Kunst, Hitler swung a small hammer at the cornerstone. The hammer broke. This might have been an evil omen: Troost was to die within two months, the Nazis soon dismantled and destroyed great schools of art including the Bauhaus, and Hitler, the failed artist and ersatz architect, eventually brought his adopted nation to ruin.